Deutscher and Hackett offer several ways to bid at auction: bidding in person, absentee bids and telephone bids. If you would like to register for any of these options, the process and bid forms can be found below. Bid forms are also available below each individual lot within current online auction catalogues, in the hardcopy auction catalogue and at Deutscher and Hackett’s Melbourne and Sydney galleries during auction previews. Bid forms can be submitted in person, online or by fax. If submitting a bid form online or by fax we will respond with an email confirmation. If you have not previously bid with Deutscher and Hackett, upon receiving your bid form we will request photo identification, such as a drivers licence or passport. If you have any queries about the auction process please see our Buying and Selling Guide or if you would like to discuss the auction process or a specific work with an art specialist please contact us. Deutscher and Hackett auctions are open for anyone to attend. If you wish to bid at the auction please complete the attendee pre-registration form. A paddle will then be ready for you to collect at the auction. If you are a successful bidder an invoice will be sent to you via email within a day of the auction. 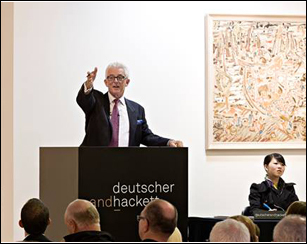 Deutscher and Hackett accept absentee bids on all works at auction, allowing clients to bid without attending the auction. An absentee bid is the maximum hammer price that the auctioneer acting as your representative can bid up to on your behalf. The auctioneer will purchase the work on your behalf for the lowest bid amount possible. If you would like to place an absentee bid please complete the absentee bid form. If you are a successful bidder an invoice will be sent to you via email within a day of the auction. If your absentee bid is not successful you will be contacted via phone or email within a day of the auction. Deutscher and Hackett offer a complimentary telephone bidding service on all works at auction, allowing clients to actively bid via phone without attending the auction. Telephone bids must be booked well in advance of the auction and no later than 24 hours prior. If you would like to place a telephone bid please complete the telephone bid form.